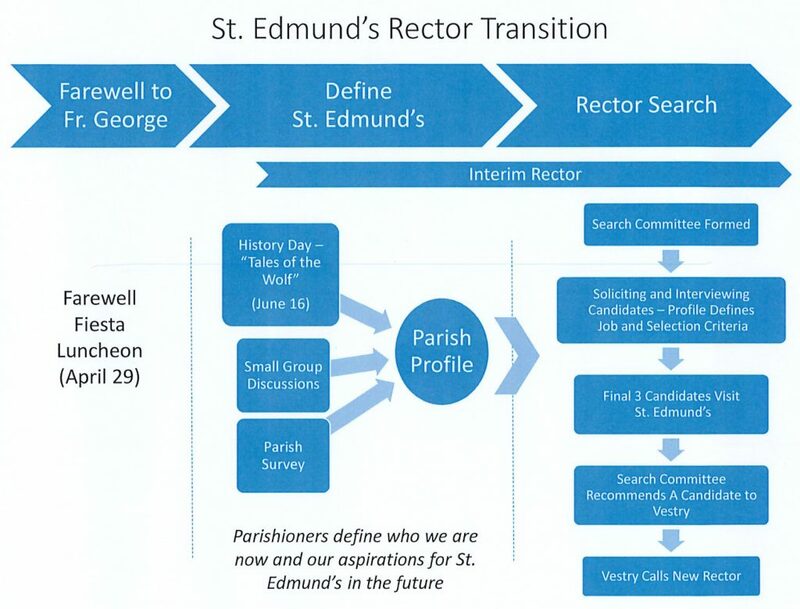 It is meant to depict three phases in the transition to a new rector. The first is the time during which we bid Father George our fond farewell and celebrate his tenure with us. That is the period we are in now, and it ends with the last service he officiates at St. Edmund’s and the farewell luncheon immediately following it on April 29th. The second phase is a time of reflection and introspection, designed to include the entire parish community in defining how we see our parish past, present and future. This phase is critical for determining the qualities we most want in our next rector, and what we tell that candidate about us. There are three major parts of this process – a “History Day” to which the entire parish is invited on June 16th (a Saturday) to reflect on the history of St. Edmund’s and share our thoughts on what it means to us and what we want it to be in the future; a series of small group discussions designed to continue the further defining of who we are and where we are going and a written parish survey that will be sent to all parishioners. There is no fixed date for the end of this second phase, but the target is Fourth Quarter of 2018. The third phase is the search phase, during which the Search Committee is formed and conducts its work, as identified in the visual. The third phase has no timeline, and could last an additional six to eighteen months.